Stay in tune with your little one with the VTech Safe&Sound DM223 DECT 6.0 Digital Audio Baby Monitor. This digital baby monitor uses DECT 6.0 technology to ensure your connection is protected against interference and eavesdropping. Condition is New. The VTech VM320 2.4" Digital Video Baby Monitor makes it easy to keep an eye - and ear - on your little one from anywhere in the house. Automatic infrared night vision. Secure digital video and audio transmission. Vtech Digital Audio Monitor, DM111. In good working condition. High-resolution, 5" color LCD screen. Manufacturer Part Number VM305. Manufacturer VTech Holdings, Ltd. Automatic infrared night vision Ten infrared LEDs automatically detect dim light, providing clear video even in dark rooms. Comfort your infant from any room with the built-in intercom on the portable parent unit. The VTech VM320 2.4" Digital Video Baby Monitor makes it easy to keep an eye - and ear - on your little one from anywhere in the house. Automatic infrared night vision. Secure digital video and audio transmission. You’ll love this baby monitor, which is as irresistible as it is practical. The VTech Bear DM226 DECT 6.0 Digital Audio Baby Monitor with Night Light features an adorable duo to help you and your little one rest through the night. Parent unit can be set to beep if: (1) link between the parent unit and the baby unit is lost, and/or (2) battery is low. 5-level sound indicator - graphic bars on the parent unit indicate the level of sound in your baby's room so you can visually monitor the noise level with the unit muted. Vtech baby monitor BM4500 camera and two chargers european plug . Condition is Used. Dispatched with Royal Mail 2nd Class. This is only camera, two chargers and wall mount. Remote pan, tilt and zoom let you scan your baby's room right from the parent unit. 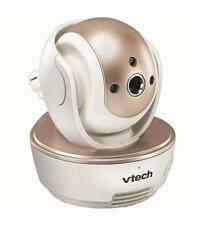 VTech VM343 Video Baby Monitor with Automatic Infrared Night Vision, Pan/Tilt/Zoom, Two-Way Audio & 1,000 feet of Range. This system allows for local and remote viewing through the MyVTech Baby app with no fees or monthly subscriptions. My VTech Baby App. Save the clip or image directly to your smartphone or tablet, so you can share it with friends. Baby unit power adapter: Input 100-120V AC 150mA 60Hz; Output: 6V DC 400mA;Parent unit power adapter:Input 100-120V AC 150mA 60Hz; Output: 6V DC 400mA. 5-level sound indicator - graphic bars on the parent unit indicate the level of sound in your baby's room so you can visually monitor the noise level with the unit muted. The VTech DM221 Digital Audio Monitor with DECT 6.0 digital technology provides crystal clear transmission, eliminating the annoying white noise you hear from analog monitors. The only sounds you hear are coming from your baby. Dell Screen Size. 2 x USB 2.0 1 x USB 3.0 Video Ports. No Bluetooth. 802.11N Ethernet LAN. Front Wi-Fi. VTech Vm342 Video Baby Monitor With 170-degree Wide-angle Lens for Panoramic &. Condition is New. Shipped with USPS Priority Mail. See and hear your little one from any room with the VTech VM341 Digital Video Baby Monitor. 4.3" LCD color display lets you see the monitor clearly even at a distance. Pictures show the exact item that you will receive. Good condition. Slight scuffs or signs of use. Comfort your infant from any room with the built-in intercom on the portable parent unit. VTech believes kids have the power. VTech's v. Smile TV learning system is a constant award-winner ensuring your kid will learn through fun and smart play. VTech VM312-2 Safe and Sound Video Baby Monitor with Night Vision New. Condition is New. Shipped with USPS Parcel Select Ground. 5-level sound indicator - graphic bars on the parent unit indicate the level of sound in your baby's room so you can visually monitor the noise level with the unit muted. DECT 6.0 provides crystal clear transmission, eliminating the annoying white noise you hear from analog monitors. Vtech Baby Moniter, in exellent used condition! Enjoy a panoramic view of your little one as they move around the nursery. Simply detach the wide-angle lens when you want to watch your child in normal view. Standard Lens and Wide-Angle Lens. Baby Monitor Type: Video monitors. VTECH 2 Camera Video Monitor w/ Wide-Angle Lens and Standard Lens VM342-2 NEW. Condition is New. Shipped with USPS Priority Mail. Hear your child even when you're in another room, and rest assured you'll know when they need you with the DM111 audio baby monitor. The VTech Digital Audio Monitor - DM111 Features: DECT 6.0 Interference Free Communication - DECT 6.0 digital technology provides clear transmission and eliminates background noise, so you can rest assured the only sounds you - and only you - will hear are your baby's. This video monitor is the VM981 and is also compatible with VM980 and VM990. Free live remote access via smartphone and tablet. VTech DM111 Audio Baby Monitor with up to 1,000 ft Range. 5-Level Sound. Preowned and fully functioning. Includes two power cords.